Congratulations to Cameron Steer in Year 9 who completed in the All Schools Athletics Carnival in the last week of Term 3. 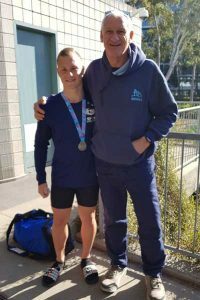 Cameron won silver in the 100 m and was selected to compete at the National Championships in Cairns in December for both 100 m and the relay. Cameron has also been selected to compete in the National Athletic Championships in April 2019 in both 100 m and 200 m. An outstanding effort Cameron, we wish you well at these upcoming carnivals.